SoftPlanet makes it possible for everyone to get free AVS DVD Player download directly from our servers. There is no registration needed for downloading. AVS DVD Player 2.4.2.125 is more or less a media player that is capable of playing all of your audio and video files alongside with any DVD disks or DVD files stored on your local drive. PAL and NTSC DVD, VCD, SVCD, AVI, WMV, etc. are only some of the many supported formats. This way you won't need a portable player for all your disks, because you can watch them on your PC or on your TV if you connect the PC with it. AVS DVD Player supports all six different DVD regions and if you have a disk from a different region – you can simply change the default region and watch the movie. Of course this app is absolutely free of charge and can be downloaded to any home or work computer. Several different views are available to choose among and also the aspect ratio of the screen can be one of the predefined or any custom one. 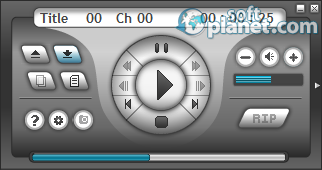 The player itself has an on-screen display for the player controls. The interface of this program has four different skins – Classic, Clean, Metal Gear and Mini. Each one of them is unique and very different than the rest. AVS DVD Player can stay on top of all currently opened windows; you can visualize the Playlist panel if you use the player to listen to audio tracks or watch videos. The player controls and display are oriented differently based on the type of the skin that you use. The timeline is always located at the bottom so you can easily jump back or forward during playback. AVS DVD Player has Jump, Step frame and Search functions which are very easy to use. In addition to that you can visualize the Navigation pad. This pad allows users to navigate through the DVD menus. As any media player this one can work in a shuffle and/or repeat mode too. AVS DVD Player 2.4.2.125 is a very reliable program and if you are not sure which one of the many existing DVD players to use – this one is a good start. Give it a try and decide for yourself whether you like it or not. AVS DVD Player is VIRUS-FREE! Our security scan shows that AVS DVD Player is clean from viruses. The current version of AVS DVD Player has been scanned by our system, which contains 46 different anti-virus algorithms. That ensures that AVS DVD Player 2.4.2.125 is 100% safe for your computer.